A Night at the (Beth Tzedec Reuben and Helene Dennis Museum) – Not scary at all! On Wednesday December 6th, three dozen Pomegranate Guild members and guests made their way through Beth Tzedec’s current renovations to the beautiful chapel for an evening of Judaic treasures – artifacts recycled and repurposed, in keeping with this year’s theme. Rkki Blitt introduced our speaker, Dorion Liebgott, who is both a long time Guild member and long time (25 years) curator of the Museum. We sat in awe of the precious artifacts Dorion brought for our delight. Of particular interest to us as textile artists were items that involved the reuse of fabrics. These included a wimple (Torah binder) of German origin. The wimple was recycled from a infant’s swaddling cloth. It was cut into strips that were sewn together and embroidered with a formula including the child’s name, birth-date, and blessings. This binder would have been wrapped around the Torah used on the child’s 3rd birthday, his Bar Mitzvah and his wedding. We also examined was a Torah crown made of damask silk (rather than the usual silver) and a parochet (ark curtain) made of recycled fashion fabrics. Dorion showed us Chanukah menorahs – one reconstructed from a rifle, and another made of empty bullet cartridges mounted on Plexiglas from the American Military – that demonstrate how Judaic ritual items can be made with objects and materials found immediately at hand. Sometimes conventional items have inscriptions added to make them suitable for Judaic purposes. We were shown a large pewter bowl with blessings inscribed with reference to the redemption of the first born son for the ceremony of Pidyon Ha Ben, and a seder plate that was also created by inscribing a standard pewter plate. In some cases items are adapted merely by use: a locked sugar box and open candy silver candy dish are two objects that have become etrog containers by declaring them so. Several Yads (Torah pointers) demonstrated a collage approach, constructed by adding multiple small pieces of other objects to create a pointer. Their awkwardness in both appearance and function are clues to the “fakery” behind their construction. Many of the precious objects Dorion showed us were from the Cecil Roth Collection in the Museum, and Dorion also shared the story of how the Reuben and Helene Dennis Museum acquired them. All the photographs in this post are published with the permission of the museum. Rikki thanked Dorion, as we all did, for a fascinating evening teaching us that we can continually recycle and re-invent old artifacts into new treasures. 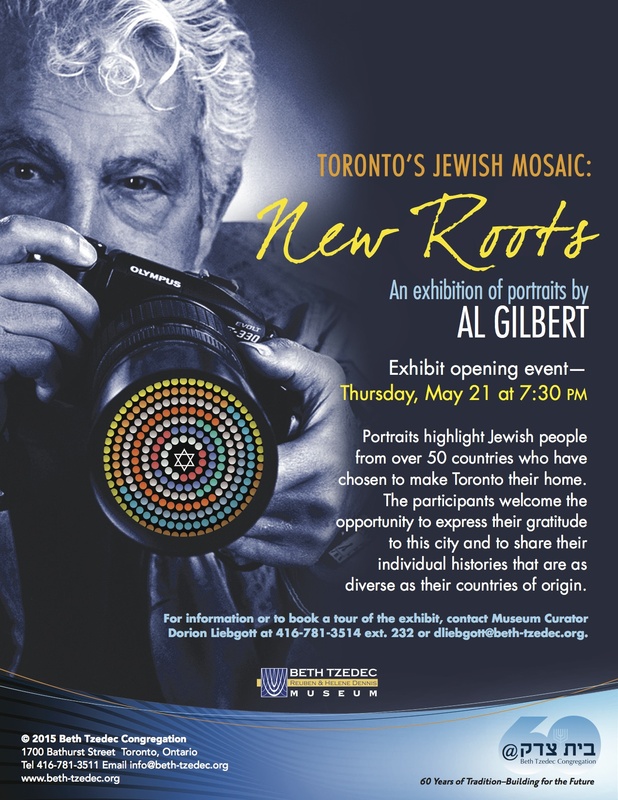 Dorion invites us all to this special event on Thursday May 21. New portraits of newcomers. And maybe you have a Gilbert portrait of your own! Guild members visit and volunteer at Baycrest (including on the Baycrest Museum Board, Phyllis Spivak, Anna Vandelman, and Melanie Siegel). 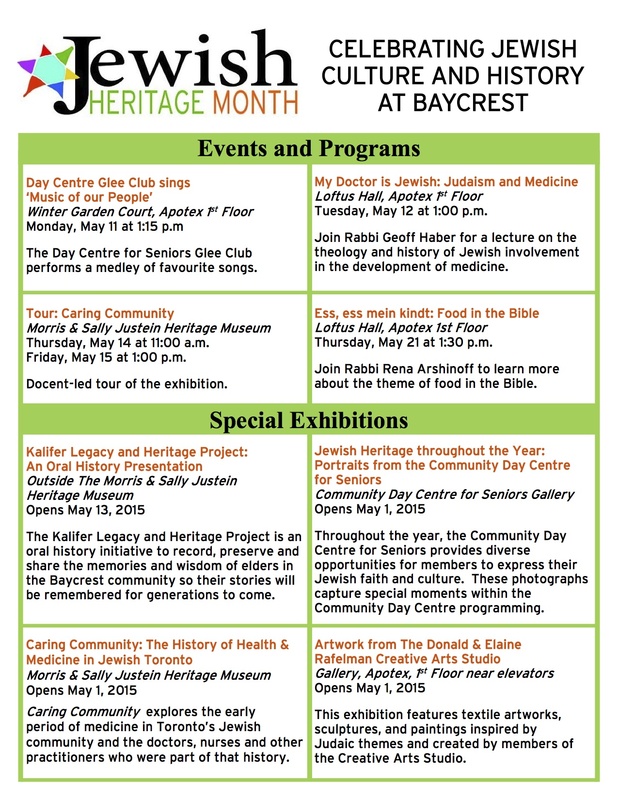 They want to let you know about the range of activities taking place during Jewish Heritage month. And while you are there, don’t forget to visit Pardes, an extraordinary example of a Pomegranate Guild group project.